Giant Jellyfish Decorations? What? Yup. Hi friends! Today's craft is a departure from my normal kids crafts. 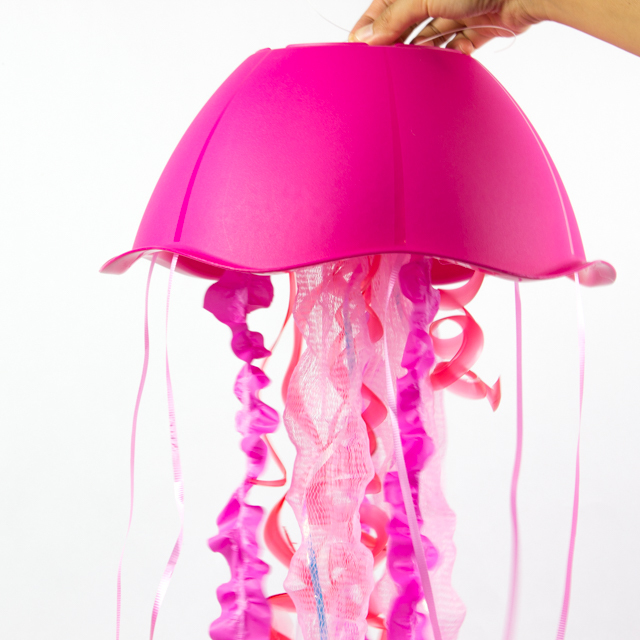 But I just had to share this gorgeous jellyfish craft here. Our church recently redecorated its nursery room. The new theme is under the sea and one of my very talented friends came up with this super easy (and cheap!) jellyfish design. We made about a dozen of them to hang up in the room and they look absolutely ethereal and gorgeous. So I thought I'd share what we did here in case any of you want to make your own giant floaty sea creatures too. A few weeks ago, we invited a few school friends over for a play date. Since having a baby less than a year ago, I've been a bit (ok... let's be honest... VERY) nervous about having people over. I'm always pooped and don't really feel like entertaining. (Ever feel that way too?) But, I pushed myself to try and that's how I found myself with 5 kids running around our fairly small home. The kids played with toys and ran around outside... and surprisingly a lot of time was spent inside, painting and making art. You read that right, friends. 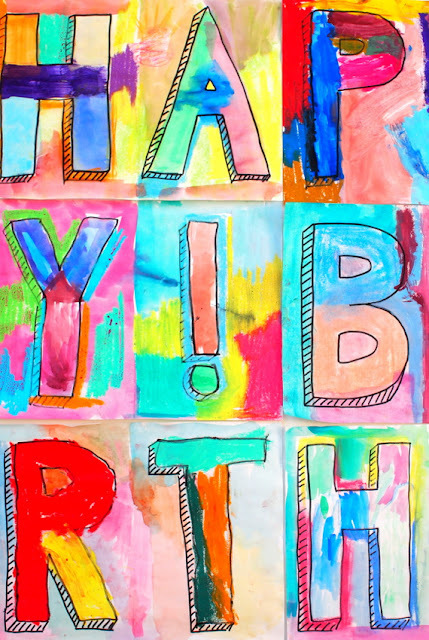 Our teacher's birthday was coming up and I invited the children to help me paint her birthday banner. Once the kids saw the papers and art supplies on our table... they got right to work, creating the beautiful birthday letters below. Who loves cats? Who loves Halloween crafts? Did you raise your hands for both? If so, you'll love making this adorable kitty gift box craft! Are you a butterfly lover? Do you know a butterfly lover? Then you're going to love today's 3D butterfly cutout wrapping paper. 3D? Oh yes. The wings pop up, making this the ultimate spring craft! DIY 3D Cutout Butterfly Wrapping Paper! This post contains affiliate links. Thank you for your support. For mu full disclosure policy, click here. 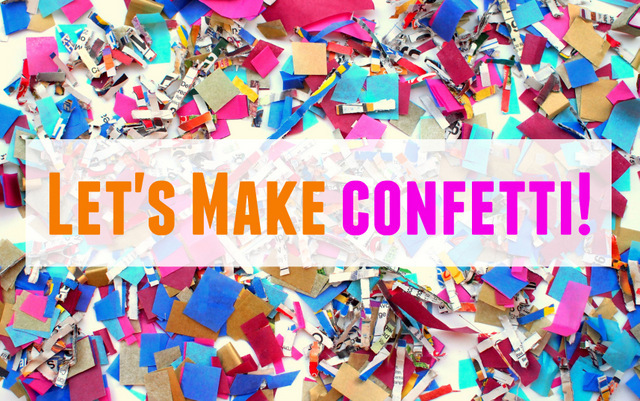 Have you ever made confetti before? I've seen bags of it in the stores, but never made my own. Recently my son and I walked with our church in our town's parade. It was a really fun Children's parade celebrating our town's Mexican, Spanish, American Indian, and early history. I really wanted Chuck to have something to throw in the parade. (Because let's face it, allowing a preschooler to throw colorful things at people = SUPER kid fun.) So the night before the parade, my husband and I made two HUMONGOUS BAGS of confetti for kids to throw. And guess what? We made it in less than half an hour. That's right. We became confetti-making machines! Here's how we did it! New Year's Party Horn Photo Props! Oof. I just realized that I never put up a happy New Year post on the blog! Thank you, dear reader, for stopping by this year. 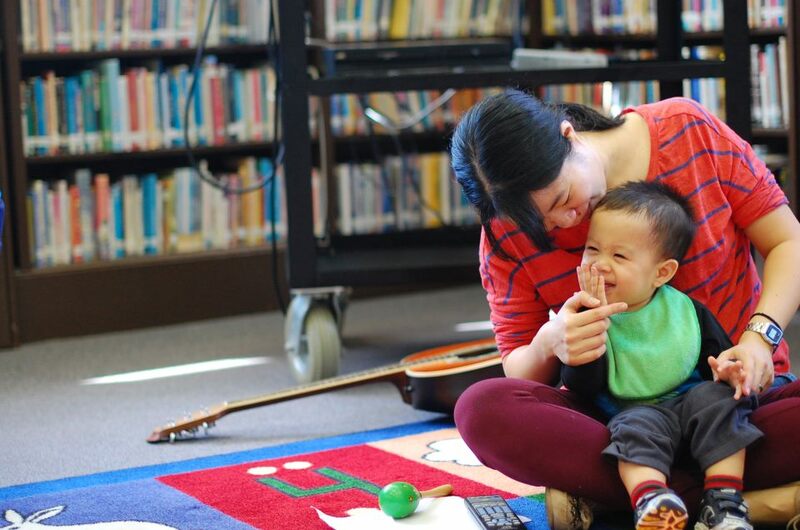 I hope you always leave entertained, smiling, and itching to make something with the kids! 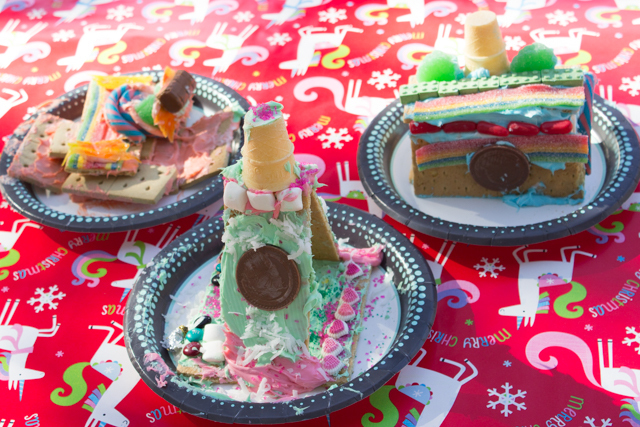 Here's a craft that I made to ring in 2015- Party Horn Photo Props! Come on. Tell me that isn't funny? You can get the full tutorial on DIY Candy! Like this idea? 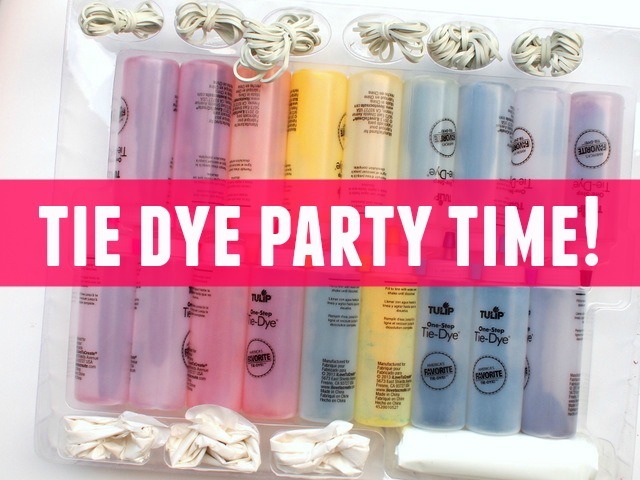 You can always find other fun ideas on my Pinterest, Facebook, Instagram, or Twitter accounts! Or, sign up for the newsletter in the pink bar at the top of the site. When we go out to eat, one of Chuck's favorite things to get is bubble tea. It's so cute watching him order. Too short to reach the counter, Hubby has to lift Chuck up so that he's eye level with the cashier. The lady then giggles when she hears his little voice. When she's done, she hands over the drink and a couple extra straws. (He loves straws.) Typically, Chuck just blows and chews on the extras... but this time he generously gave them to me so that I could craft with them. I saw how much he loved blowing on party blowers at another child's birthday party. So, of course I had to try making them for him at home. 1. 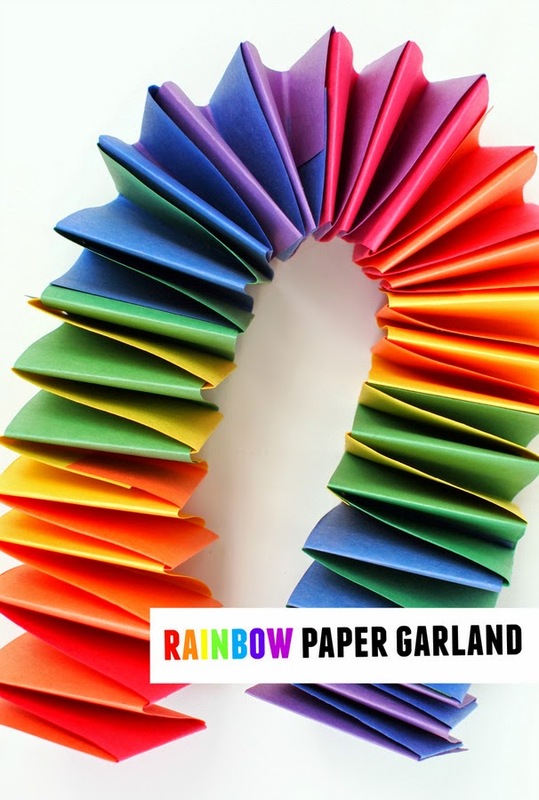 Fold your paper in thirds lengthwise. Tape your paper where the two sides meet. And that's it! Hand your party blowers over to your kid and watch them have fun! We just used magazine paper, so our blowers only lasted for about a couple of minutes before they stopped recoiling or ripped. But not to worry! I washed, dried, and cut up the straws to make some "beads." 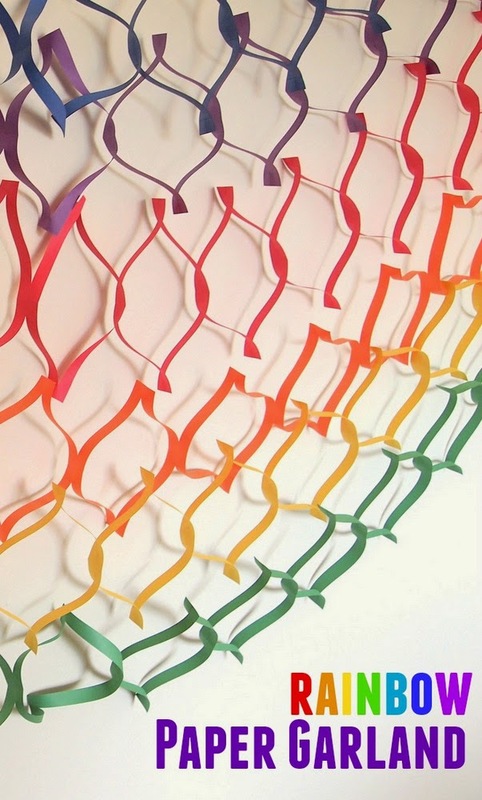 Chuck then enjoyed stringing them onto some pipe cleaners. To end this week's series of wedding themed posts, I wanted to show how I wrapped and presented our "Good Night, Bonne Nuit" pillow cases to the bride and groom In the spirit of DIY, we made both the card and the gift box. Chuck's finger painting became the envelope and mine became the card. (The white swirls were made by first drawing on the watercolor paper with an old Easter egg wax crayon. After covering the paper with paint, the portions that were scribbled on with the wax crayon remained white.) Oh yeah, and in case you're wondering, the card reads something along these lines: "life is better when you're walking hand in hand with the person you love"
Cute right? Wish I could take credit for this idea, but I can't. I first spotted it at the amazing Aunt Peaches. Then, I placed a piece of pink tissue paper inside just to make sure that my pillowcases stayed nice and clean. And there you have it. Tada! A handmade wedding card and gift box that's pretty to look at and so simple to make. (A child could do it...really.). Hooray for creatively used crap! This past weekend we attended a cousin's wedding in Brooklyn. It was a wonderfully intimate and elegant affair. The bride and her mother's touches were everywhere. The lovely bride altered her own dress and both ladies worked together to bake and decorate the cake and put together all the floral arrangements. Can you believe these flowers aren't real? They're edible and made by hand. Congratulations A and C! Thank you for letting us be a part of your special day. Chuck and I continue to really enjoy music time at the library. Thanks Vanessa for taking such a lovely photo! I think Chuck looks good with a beard, no? It's so sweet how Chuck's face lights up whenever he sees this little girl. When we first moved back to New Jersey, I was afraid that we wouldn't find community. Last week our toddlers group held a cowboy party for the kids. Yup. I've found my kind of people. Psst- Tomorrow I'll share how I crapted Baby Chuck's cowboy costume from felt, cardboard, and a cake tin.